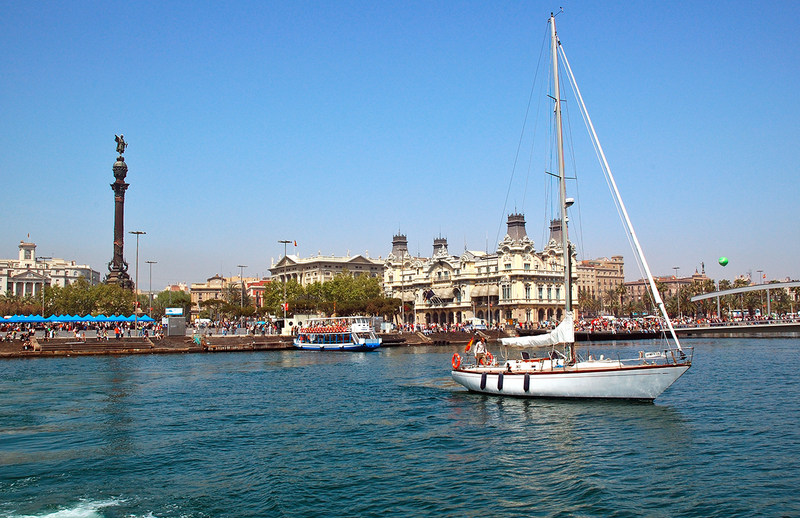 As I said in a previous post about sightseeing in Barcelona harbour and along the coast, a cruise on board of Las Golondrinas boats is a good teaser or appetizer before visiting the city. Of course you can plan your vacation trip in whatever order you wish!. Remember I told you about big and small boats covering a full route including harbor and coast or just harbour respectively, well, today in my blog I wanted to show you the old Golondrinas (see the one next to the steps?). This photograph I took on departure on board of one of the modern ships. It was great to take pictures as the landing docks grew tinier in the distance. The wooden platforms and stairs were full of tourists as you can see. To the left the Columbus Monument and a little to the right of the Golondrina, the Harbor Authority building, featuring an impressive architecture which I intend to cover in a different post soon. The next days I may be publishing irregularly because I will be in Madrid until next Tuesday. I suppose I can publish from the hotel. In case I can't, you will get your daily dose of images in a row on Wednesday. Feed Issue: I am tampering with blogger labels again so feed subscribers may have noticed the service broken. It is a well known blogger issue that, upon changing old labels or typos, the feed shows old posts as newly published. This inconvenience has been fixed now. In case anyone is interested you can find the workaround here. Note: From here I would like to thank Conny of Saabrücken Daily Photo, for choosing me as the winner in her Haiku competition and recommending my link too. Looks like a wonderful way to see the city. This is a splendid view filled with people and places to see. What a beautiful harbor! This is definitely where I would want to begin my tour!I'm just dreaming! Just reading your description of the boat trip is enjoyable; it makes me remember such trips in other places Stockholm and Chania. If I ever make to Barcelona, I'll be sure to find a boat. I must say I enjpyed the boat trip on the sailing catamaran much better. Compared with the Golondrinas, it was peaceful and romantic, and did just the same trip.